This peak is situated between the valleys containing Eagles Lough and Lough Coomnacronia. Note that there is another valley called Coomnacronia in the Glenbeigh Horseshoe. Coomnacronia is the 227th highest place in Ireland. Picture from group : Coomnacronia beneath Knocknagantee on the skyline. Picture: Coomnacronia beneath Knocknagantee on the skyline. This summit is one section of the dramatic and continuous part of the Dunkerrons, stretching almost in a straight line from Mullaghanattin to An Bhinn Láir above Cloonaghlin Lough. 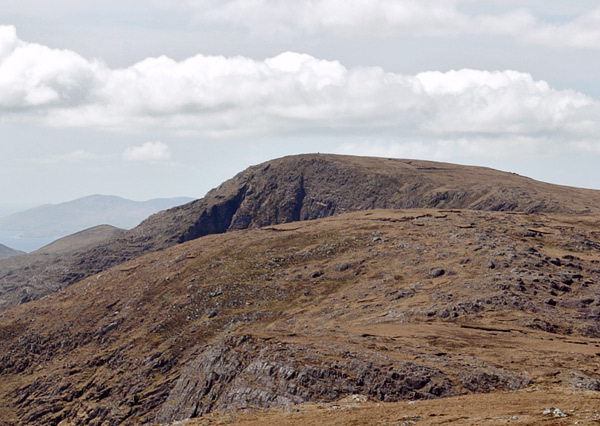 It forms one of the four corners of an unusual high plateau also bounded by Knocknagantee, Knockmoyle and Coomura. It will often be reached from one of its neighbouring summits, however if you wish to get there directly, you can possibly start on the track leading off the public road at V69259 71239 A. Ask permission at the house there. The track (it's the west of two shown leading from Fermoyle) has a stony surface until you reach the Small River where it turns into a quad trail, eventually ending near Lough Coomnacronia. Branch off the track and reach the top over steep but passable ground.